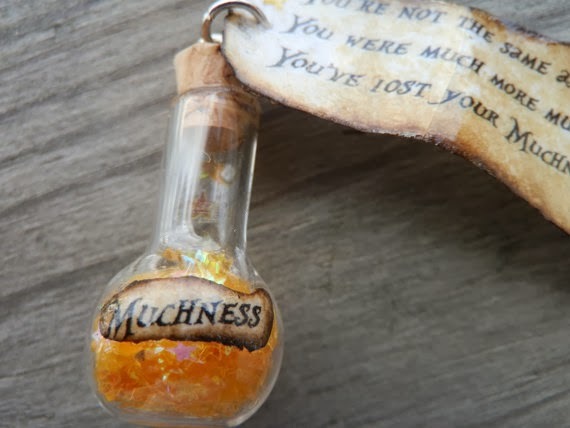 “Lost My Muchness Have I!” ~ Lessons from the Mad Hatter…Who knew? “There is a place. Like no place on Earth. I find silence challenging. When I’m alone I will sing, play music or put on a movie as background noise while I work on other things. I think, perhaps, it comes from growing up in a family of 6 children. My background movie of choice very shortly after my diagnosis of PD was Tim Burton’s version of “Alice in Wonderland”. As a quick summary, it’s based on the story by Lewis Carroll but takes place later in Alice’s life. She is overwhelmed to discover that the purpose of her return to Wonderland is to become a warrior and slay the fierce Jabberwocky. Hatter: You’re not the same as you were before. You were much more…muchier. You’ve lost your muchness. Hatter: In there (he points to her heart), something is missing. As I heard those words my heart froze. I stopped the movie and played back the conversation again and again. Finally, I had found it! The words to explain what I had been feeling inside for months. You see, the day I was diagnosed with Parkinson Disease, was the day I lost my muchness. Before that, I had been much more…muchier. Something WAS missing, my Muchness. Gone was the extroverted, audacious, singing in the rain, pre-PD Meg (This might be hard to believe, but once; I was actually accused of excessive cheerfulness). Now I was introverted, quiet, no rain, no dance, hide from the world, post- PD Meg. Outwardly I acted “normal”, pretending I was the same while gradually my lack of muchness pulled me down. I didn’t know how to explain why I was feeling this way or what to do about it. There were no words, just feelings. But NOW I had a name for it and NOTHING was going to take it away! So began my quest to regain my muchness! Tell me if this sound familiar to you. Throughout the movie, Alice faces many challenges but has to carry on as giving up is not an option. By trusting herself and her friends, she finds strength and courage. She won’t let her fear of the Jabberwocky (PD) keep her from doing what she is capable of. Just as Alice had to fight to find herself, we too have to fight to find ourselves again. It won’t be quick; some days are easier; some days much harder; but since I realized my muchness was missing, I’ve never stopped working to get it back. I will admit that I am still not quite as ‘muchier’ as I once was, but my muchness is alive and well, and getting stronger all the time. Who knows, I could be accused of excessive cheerfulness any day now! ← Take These Broken Wings ~ Are you ready to fly? You have explained so well how I feel right now! My muchness has gone into hiding and I miss her. I miss feeling free and dancing in the kitchen, walking along walls and wearing loud clothes. it is time to have a cup of tea and go muchness hunting! That’s wonderful!! I wish you much success on your hunt! !